Even when you are eating a dessert you can look out after your skin. 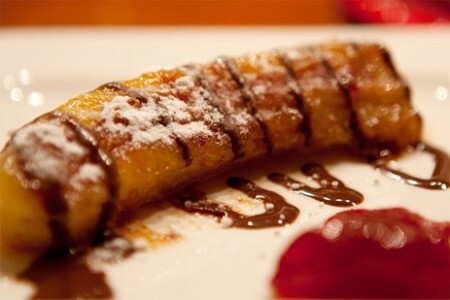 One of my favorite desserts is Grilled Banana with honey and cinnamon, which I discovered in Brazil. Bananas are full of wrinkle fighting nutrients that helps fade age spots and prevent fine lines and wrinkles from forming. While the vitamin B6 protects against free radicals that cause oxidative stress and premature aging, the potassium hydrates and moisturizes your skin. Combine bananas with honey (which is a great natural antioxidant) and cinnamon (improve fine lines by “plumping” the skin) and you have a natural-skin-booster-dessert, which tastes delicious too! It’s very easy but you have to be careful not to burn the banana! Take 1 banana, and slice it in two. In this way the banana has one flat side. Cover the banana in olive oil with 1 teaspoon. Place the bananas on the center of a grill. Slowly grill them and when you think you are almost done, sprinkle the cinnamon on top and let it stay there for a minute or two. Take them out (be careful!) and serve them with honey and sprinkle (or melt) dark chocolate on top. BON APPETITE! Note: If you don’t have a grill pan, you can also use a normal pan with a non-stick coating.